Celebrating the 100th Anniversary of the Royal Air Force 1918-2018. 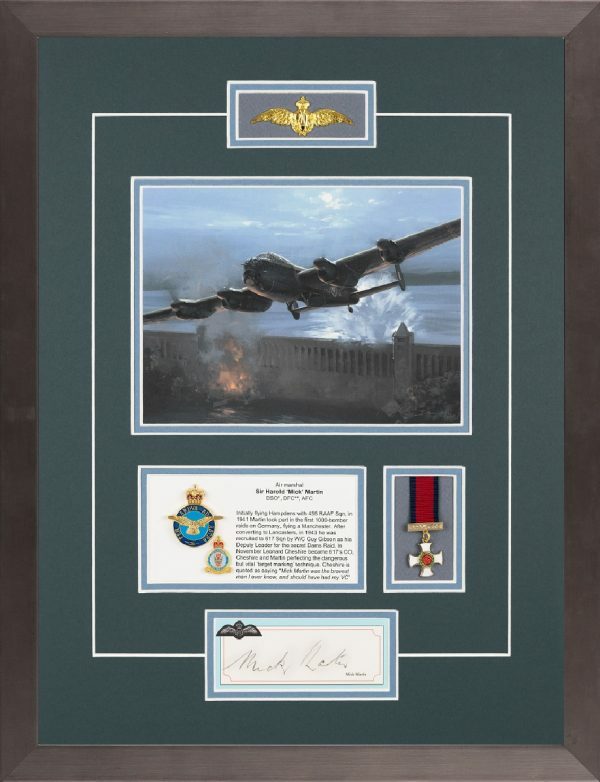 These professional & beautifully presented Autograph Print Ensembles™, produced for investment and display,have incorporated rare, sought-after genuine signatures of highly decorated Fighter Pilots and Bomber Aircrews from World War Two. The signatures were personally collected in the early 1980s by Mr Pat Barnard, who had founded the Military Gallery during the 1970's. They are mounted together with a print by the artist Darryl Legg, all-metal pilots wings finished in gold (RAF) and each edition contains miniature gallantry medals. Each edition is supplied Mounted (ready-to-frame or display) or Framed, using one of the superb options available below. This very exclusive Edition of Ensembles has been created specially to celebrate the 100th Anniversary of the Royal Air Force, but in particular pays tribute to the tens of thousands of volunteer aircrew who flew WWII’s fearsome day and night bomber missions over enemy territory. Their bravery and sacrifice is written in aviation folklore, and this very small edition is dedicated to each and every one of those gallant airmen. 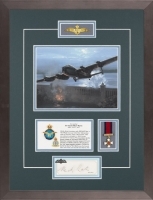 Requiring great flying skill, navigational precision and inordinate courage, what better way to remember the heroism of bomber aircrews, along with commemorating the Centenary of the Royal Air Force, than to celebrate the triumph of the Dambusters in May 1943 and endorsed with the original autograph of the Deputy Leader and pilot of Lancaster AJ-P on this most famous of bomber raids: Air Marshal Sir Harold "Mick" Martin. Sir Harold ‘Mick’ Martin. he first flew with 455 RAAF Squadron laying mines before moving to 50 Squadron and converting to Lancasters. He took part on the huge raids to Cologne, Essen and Bremen before being called and invited to join 617 Squadron on a special mission headed up by Wing Commander Guy Gibson. This mission which took place on the night of 16th/17th May 1943 became one of the most famous and legendary missions carried out during World War Two - The Dambusters. He flew the third aircraft AJ-P on the raid which attacked and bombed the Mohne Dam. He stayed with 617 Squadron before finishing the war with 515 Squadron flying the Mosquito and then as a planner with 100 Group. He retired from the RAF in 1974. Each edition is available mounted & framed or unframed (please see Options below). Each display is completed with dramatic artwork, a gold & enamel-finished Royal Air Force badge, a miniature ceremonial replica DFC medal in real silver plate (more DFC’s were awarded in World War Two than any other bravery award), and a matching numbered Certificate of Authenticity. Each autograph was personally collected in the early 1980s by Mr Pat Barnard, who had founded the Military Gallery during the 1970's. These original signatures formed part of a project supported by Group Captain Sir Douglas Bader, Group Captain Leonard Cheshire VC, Air Vice Marshal Johnnie Johnson, Brigadier General Robin Olds and General Adolf Galland, all of whom advised and helped Mr Barnard collect the signatures. Every Autograph (signature) offered by the publisher with this series of "Ensembles" is guaranteed to be original and genuine. Our reputation depends upon our integrity: We do not buy signatures from outside sources where it is often difficult to ascertain authenticity. We have the undisputed provenance for each signature which means that every Certificate of Authenticity supplied by the publisher is as genuine as the signatures it supports. The Certificate of Authenticity supplied with each original autograph is authorised by the publisher, therefore making the Certificate a valuable document in itself. To counter the proliferation of forged signatures in the market today, and to guarantee the genuine nature of your investment, please keep your Certificate safe and secure. It will ensure there can never be any doubt as to the value of your collection in years to come.